The excavation of a prehistoric burial cist, situated high up on Whitehorse Hill on northern Dartmoor, has commenced. 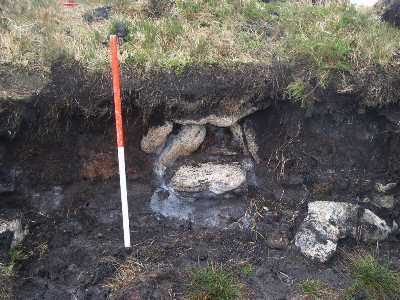 The cist was discovered 10 years ago when its end stone fell out of the peat hag which had been concealing it. A temporary wall was erected in front of this area in an attempt to protect the archaeology which it may still contain. The cist is particularly unusual because of its situation within peat and its apparent isolation from other known archaeological sites. 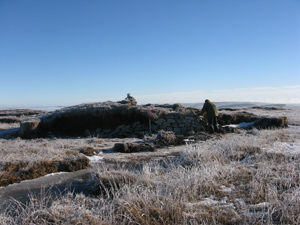 Over the last 10 years the peat surrounding and overlying the cist has eroded away because of its exposed condition and the decision was taken to excavate it in order to recover any surviving archaeological and environmental information which it might contain. It is well over 100 years since a burial cist was excavated on Dartmoor. It is hoped that analysis of buried pollen, insects and charcoal within the peat will help establish detail of the contemporary surrounding landscape. Artefacts deposited as part of the burial ritual, such as pottery, beads and stone tools will add to the understanding of the time, five thousand years ago, when the burial is believed to have taken place. The best known cists in the area are probably those to be found at Merrivale (NGR SX 55487476) at Drizzlecombe (NGR SX 59156721) and the cist which now can be seen in the garden of the High Moorland Visitor Centre. This cist was originally situated below Thornworthy Tor, Chagford, close to Fernworthy reservoir and is one of two which were discovered within a burial mound in 1879. It was excavated by William Pengelly, a prominent Torquay archaeologist and geologist. Unfortunately it was ransacked before he completed his excavation, all that remained were some discarded beaker pottery fragments and a few flint tools. Following Pengelly’s excavation the landowner donated the cist to the newly opened Torquay Museum which was run by the Torquay Natural History Society, both of which Pengelly had been instrumental in founding. Torquay Museum having rearranged their major exhibits no longer had sufficient floor space for the cist and it is now on loan to the Dartmoor National Park Authority and is situated in the garden at the back of the Visitor Centre. There are nearly 200 surviving cists on Dartmoor and over 90% of these have their long sides orientated in a NW/SE direction. The reason for this particular orientation is not clearly understood, but it was obviously of significance to the prehistoric grave builders. It is anticipated that the excavation will be completed by Friday 12 August and publication of the findings will take place later in the year.